An excellent tool for professionals, Works with any file extension types. I am a self employed accountant, I like Folder Lock because it enables me to keep safe my clients personal information. It has so many protection features unlike other software in it class. After downloading and trying it, I was sold on its ease of use and how dynamic its protection features are, thus, I purchased it. I would recommend it for all work at home professionals who deal with personal information of individuals. I bought this software to lock my folders because I used to consider encryption is a slow process and takes time. But I just got amazed by the speed of encryption in this software, its just too quick. I created an encrypted container of 50GB in just 20 seconds, phewww that was quick. I have never found any encryption software that provides encryption as quick as this one. So, if there is anyone out there who thinks encryption takes time (just like I used to) just try folder lock and you would know how fast encryption can be. I have recently started using Folder Lock and I found it very helpful. I started with the trial version as thought it might be difficult to use and would require a lot of learning. Once I started to use the application, I found it quite simple and it took me no time to understand how it works and I decided to get the full version immediately. I feel secure that my data is protected with one of the best security software and I do not have to worry about my sensitive files while sharing my PC with my colleagues. The encryption comes in an improved way in this version of Folder Lock. And the combination of history cleaning feature and USB protection makes it a great product for a home end user like me. Haven't gone for online back though. I hope it comes as good as it is advertised. Good work, though. jetz must be talking about TrueCrypt. Who knows if Folder Lock has backdoors or not. But the FBI are spending big bucks trying to figure out how to crack TrueCrypt I understand. There are a lot better freewares then this scamware junk! I've been looking for a simple to use security product. This was suggested on a forum and I tried it. It does exactly what I want neatly and simply. Easy to install, easy to use and some really useful options. I was happy to pay for the full version. I don't know what roymccoy is saying and why? I am using FL without any trouble, I am hiding some files in the locker, as well as locked a few folders on my PC, and it is working perfectly fine. The last 9 reviews that rated this a 5-star software, are from guys that has NEVER reviewed anything else but (their own) this program. Usually I'm not a fan of antivotiing, or unrelated reviews, but as others points out - these reviews are all made by the developers them selves - or someone in the chain on profit - of Folder Lock! It's strikingly obvious, and annoyingly pathetic! yup, i noticed all the fake reviews on a few other sites too. keithgub is yet another of the program's author clones. This guy just doesn't learn! Keep the anti-votes coming guys! when I was using its trial version I tried all its features and after getting satisfied I now have bought its full version. I like almost all the features as they are for protecting my data and my privacy, particularly that password protected lockers cannot be deleted, move , edited and opened without the correct password. It ensures me that whatever I put in the locker is completely safe from getting lost or misused. I would highly recommend this software . Hah! Okay, I'll throw in an antivote just for the heck of it. 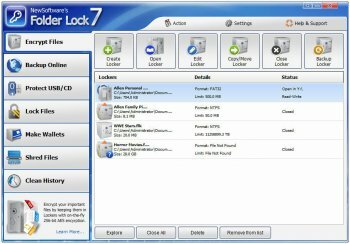 Parez, joined February 4, 2009, has written one and only one review, that being for Folder Lock--on February 4, 2009. Blasie, joined February 25, 2009, has written one and only one review, that being for Folder Lock--on February 25, 2009.
johntim, joined September 2, 2009, has written one and only one review, that being for Folder Lock--on September 2, 2009.